Edin Dzeko has been a hit at Roma since arriving in Italy from Man City, but according to recent rumors, the attacker could be on his way back to England. The International Champions Cup may not have kicked off but the participants and fixtures have been confirmed for the 2019 edition. The event organizers revealed all on Wednesday, March 27, announcing the 12 countries that will participate this time around. Roman Abramovich would reportedly turn a profit of over $3.9B if the deal is sealed. A wind of change could be blowing at Stamford Bridge, as Roman Abramovich's days as Chelsea's owner could be numbered. Roma hold a slim 2-1 lead after the first leg and will hope to book their spot in the quarter-finals. 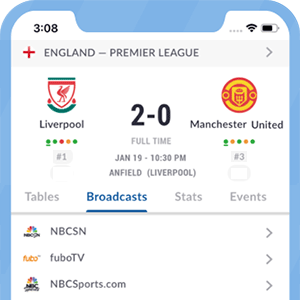 Live Soccer TV's match preview provides match facts, team news, and global broadcast listings for Porto vs Roma. Dortmund vs Tottenham, Real Madrid vs Ajax, Japan vs England, USWNT vs Brazil, PSG vs Man United, and Porto vs Roma comprise our list of must-watch games for the next two days. Lazio and Roma will lock horns in the latest edition of the Derby della Capitale on March 2nd. Live Soccer TV's match preview provides team news, match facts, and broadcast listings for Lazio vs. Roma. The French outfit takes on the almighty Blaugrana on Tuesday in the first leg of their round of 16 showdown. Lyon is gearing up for a crucial Champions League clash with Barcelona. The French side is making their first appearance in the round of 16 since 2011/12 and will have to face one of the favorites for the title in the form of Blaugrana. LiveSoccerTV provides info to catch all the fixtures taking place on matchday 24 in Serie A, including Juventus vs Frosinone. Will Roma be able to shake off their turbulent domestic form when Porto come to town? LiveSoccerTV's match preview provides match facts and global broadcast listings for Roma vs Porto kicking off at 15:00 EST (21:00 CET). It's a tense battle for fourth spot as Roma and AC Milan lock horns at the Stadio Olimpico on Sunday, February 3, 2019. Elsewhere, Roma vs Milan, Sporting CP vs Benfica, and Lyon vs PSG feature in our list of exciting games on Sunday. Catch this game at 9:05 ET/14:05 GMT on NBC Sports, Telemundo, and SiriusXM FM in the USA; Sky Sports, TalkSport Radio UK, and BBC Radio in the UK; Sportsnet in Canada; and Optus Sport in Australia. Both Fiorentina and Roma will be hoping to keep their hopes of silverware alive as they lock horns in the Coppa Italia quarter-finals at the Stadio Artemio Franchi. The team's community manager has been involved in a number of controversies, but this time, their good intentions were what caught the eyes of fans. Things could have turned out quite different for Spurs if the Russian tycoon had chosen to splash cash to buy the club. Exciting Premier League action also comprises our list, as Liverpool, Chelsea, and Man United will be in for tricky tests.